I loved the scientific quality of specifications grading! It promised me that writing and grading could be simple and straightforward. I gave the specifications to my students, and we discussed them. We looked at a sample paper and tested whether or not it met the specifications. Based on this discussion, I felt confident that my students understood the specifications. Then my students wrote and submitted their essays. Out of a class of 32 students, only 2 people met all of the specifications I set for the essay. The rest of them missed at least one specification, thus failing the essay. This was not a group of low-achieving students. They were not lazy or intentionally disobedient. They had been well informed about the specifications for the assignment. If my students knew what they needed to do, why didn’t they do it? Like most teachers, I was operating under the assumption that if only I were clearer in my explanations, then my students would do better. I believed that my students needed more explanation and specificity, especially when it came to assignments. If I told my students exactly what they needed to do, in a way that they understood, then they would do it. When I asked my students for feedback on my specifications grading experiment, many of them told me that the list of specifications was overwhelming. One student said that she felt “paralyzed” looking at it. A few students said that they were so focused on meeting the specifications that they couldn’t think about the essay topic. Some students said they knew they weren’t meeting all the specifications when they submitted the essay. “I couldn’t do it all at the same time,” one said. Despite this initial failed experiment, I continued to use some form of specifications grading for a few semesters. On one hand, specifications grading did make my expectations clearer to students. Over the course of a semester, my students did improve. I appreciated how specifications grading demanded success from my students and did not offer partial credit to work that was below standard. But the costs of such a system were too high, at least for me. My students were under extreme stress because not meeting the specifications essentially meant a grade of F. I sensed that this stress was actually keeping my students from doing their best work. Their minds were tense and closed up. They wrote out of a fear of failure rather than out of engagement with the subject. They were often so focused on ticking all of the boxes that they missed the whole purpose of the assignment. The detailed specifications made my students “scared of doing something wrong,” so they wrote safe, formulaic essays. I noticed that the more specifications I gave, the more the students forgot about the larger purpose of the assignment (to think) and simply worked to meet my standards. When I asked my students to use five quotes in an essay, they used five quotes without thinking much about it, and certainly did no more. Also, specifications grading caused me to miss the point of what I was doing. I found that when I led a discussion about a story or poem, the essay specifications were too much in my mind. I was unable to fully listen to my students. I was teaching to the specifications — to the future essay — rather than being present in the room with the students and their ideas and questions. Specifications grading offers great possibilities for further study, but I went in the opposite direction. I no longer specify much of anything when I give an assignment. I celebrate vagueness. I try to craft my essays around a thought-provoking question and then let the students have at it. If anything, I specify process rather than product. “Read and annotate the readings multiple times before writing,” I might say. 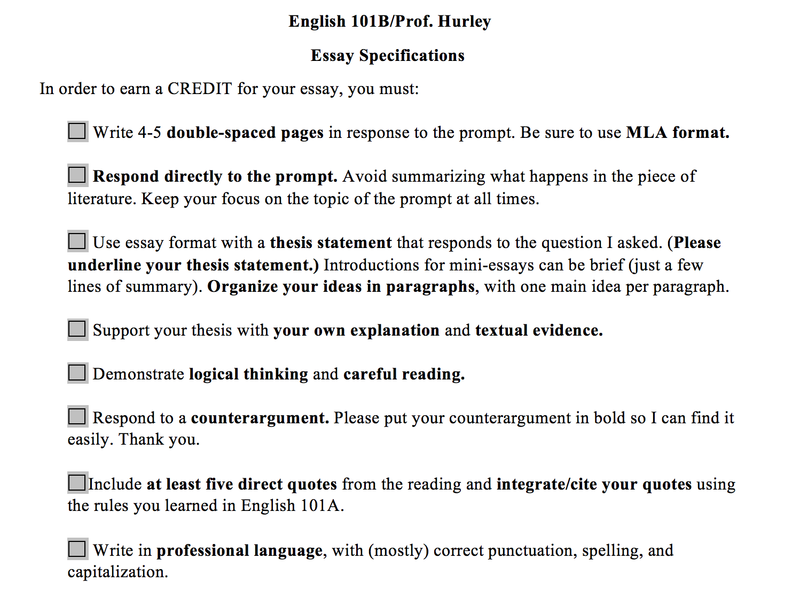 Or, “Imagine you are writing to a reader who disagrees with you and try to sway them over to your side.” I know that some students are frustrated by the vagueness of my essay assignments, but I think that’s in part because they are so used to being told what to do that freedom makes them panic. However, as Daniel Pink asserts in Drive, “autonomy,” “mastery,” and “purpose” are the essential components of motivation. When students have ownership over their essays, they work harder, feel more motivated, and produce deeper writing. In the end, my students meet the specifications, even if I never spell them out.